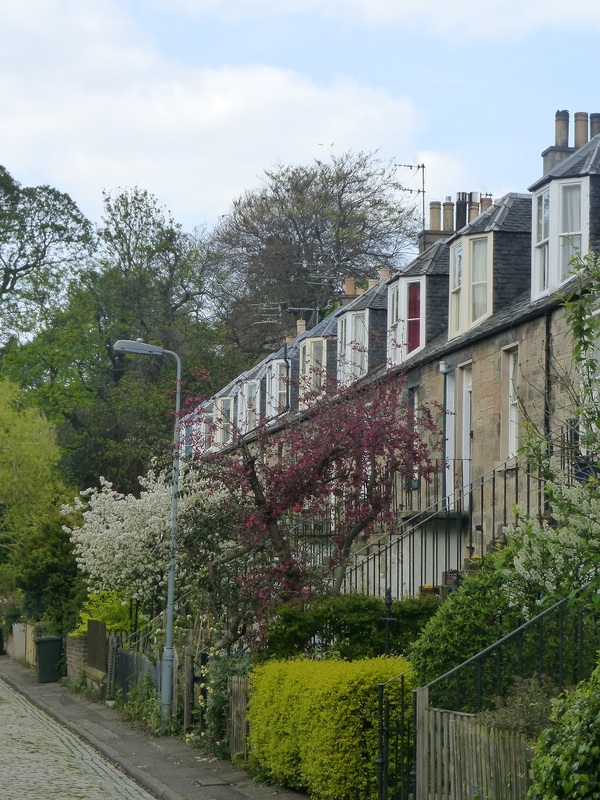 What are the Stockbridge Colonies? We live in the Stockbridge Colonies, a delightful area with interesting orgins and characteristics. People often ask about the name and about how they came to be – in a city centre best known for its cliff-like terraces of Georgian grandeur, our Victoria cottages are something of a contrast. Before I start talking about the history of the neighbourhood though, I should warn you that I have a Masters in Housing Policy and a particular interest in Victorian philanthropic housing – I can bore on for hours about Saltaire near Bradford or Bourneville in Birmingham, and the early Garden Cities were fascinating because… So I’ll keep editing and try not to go on too much about the aspects of Colony history which are only of interest to me. 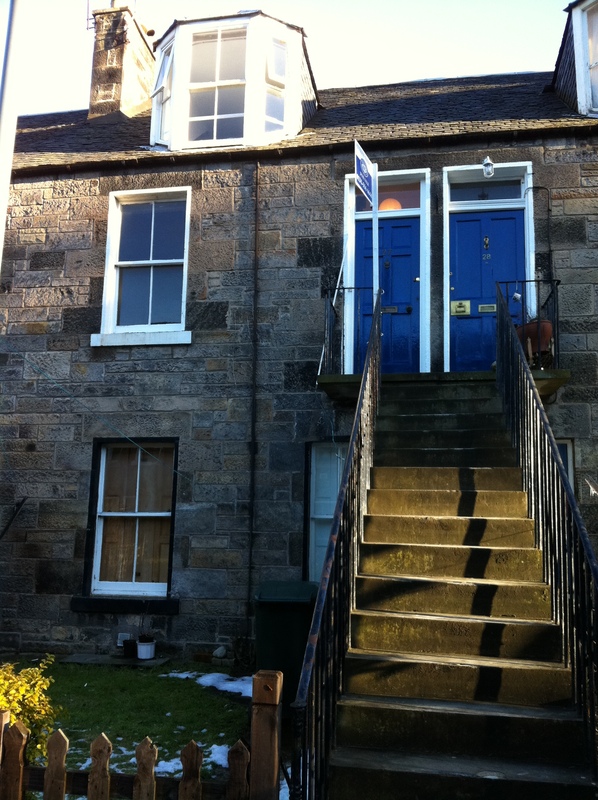 The Stockbridge Colonies were built between 1861 and 1911 by the Edinburgh Co-operative Building Company to provide housing for working people who could buy shares in the company for £1, receiving a dividend based on profits each year. The formation of the company stemmed from an industrial dispute about working hours in 1860. Joiners and stonemasons were locked out and came together during this period to start building homes near the Water of Leith in Stockbridge. Although the early 1800s had seen the development of the New Town with it’s townhouses and sweeping crescents, housing for the working classes in Edinburgh, especially that in the Old Town, along and around the Royal Mile, was appallingly over-crowded and unhealthy. The land bought by the ECBC, also known as Glenogle Park, was cheap – the river was polluted by industrial waste and sewage and the building plot formed part of its flood plain – and unattractive to more commercial developers. Similar developments had been constructed at Pilrig and Rosemount Buildings in other parts of the city, but the Stockbridge Colonies were the largest development of these type of buildings. The colonies were popular with people working in the building trades, shop-keepers, clerks with lower flats costing £130 and larger upper flats £150. Affordable mortgages were available from some of the cities property investment companies which made home-ownership possible for the working classes with a secure, if low, income. Not all Colonies were owner-occupied; some were sold to private landlords. I haven’t been able to find much information about how the colonies fared in the early to mid 20th century – my mother-in-law tells me that they were quite run down in the 50s and then became more Bohemian in the 60s and 70s. In fact, the much posher Georgian New Town was quite run down in the post World War Two period and the city council purchased some properties to save them from further deterioration. The property boom of the 1980s saw an increase in gentrification and although there are still long-term tenants on fixed rents and owner-occupiers who have been there for decades, the demographic profile of the neighbourhood is much more middle-class than the original residents. From what I gather, our property was let to a sitting tenant for over 20 years with the landlord living in England and rarely having anything to do with the property. Including maintaining the electrics or heating as far as I can tell… We’ve had a lot of work to do on that front! The area still has a fairly arty air, with a high proportion of arists and writers among the residents and my own experience of living in Hugh Miller Place a few years ago was that Colony dwellers see themselves as the alternative face of Edinburgh’s New Town! The street names are somwhat confusing if you look at maps – it is best to think of the names as belonging to the terrace of houses itself rather than the road outside. There are eleven terraces, each of three stories. Now, if you look at the picture above, you’ll see that on the right hand side there are steps going up to first floor level but not on the right. That’s because there are upper colonies which occupy the top two stories and have steps going up to them and lower colonies which are single storey flats accessed at ground floor level from the other side of the terrace. When they were built one of the guiding principles of design was that all families should have their own entrance and own garden, signifying another move away from the overcrowded Old Town tenements. Although the lower and upper colonies in one terrace are accessed from different sides they have the same street name. So we’re an upper on Bell Place and the lowers have their front doors on the street behind but it’s still Bell Place. On the opposite side of the street from our front door are the entrances to the lower colonies of Kemp Place and the uppers of Kemp Place are on the other side facing one side of the Avondale Place terrace. Is that clear as mud now? The pic on the right was taken a few years ago before we moved in here. As you can see, the uppers share their steps with their neighbours which is quite nice from a social point of view. The Colonies are a great example of how fairly high density housing can be built while still enabling people to have their own front doors and gardens. 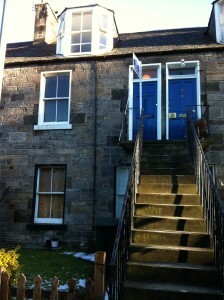 This entry was posted in Home and tagged Colonies, Edinburgh, home, Stockbridge. Bookmark the permalink.